Scratch YOUR LETTERS one at a time. For each of YOUR LETTERS revealed, scratch only that same letter each time it is found in the word boxes. Continue until all of YOUR LETTERS and the corresponding letters in the word boxes are revealed. 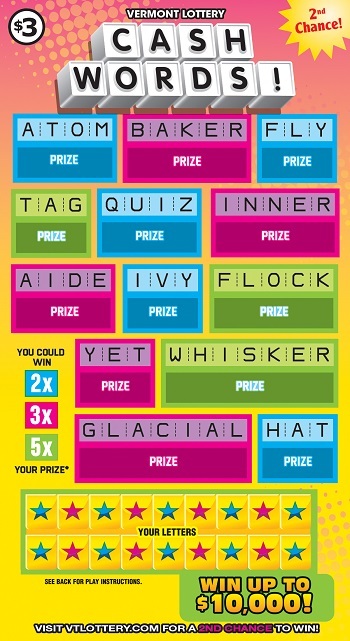 Reveal one completed word in the word box, win the corresponding prize. 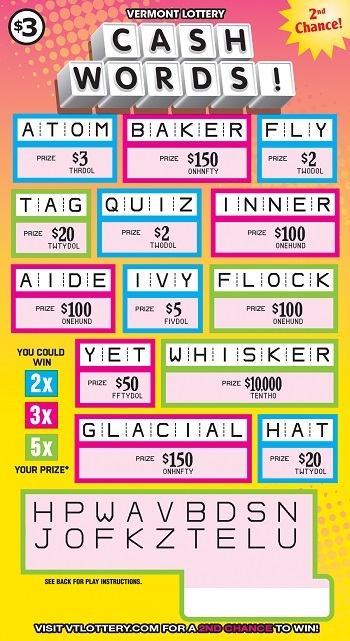 Reveal all the letters for all the same color word boxes, multiply the total of the prizes won as per the prize legend below. If all 5 blue boxes are revealed, multiply the total prizes won by 2. If all 5 green boxes are revealed, multiply the total prizes won by 5. Enter your non-winning CASHWORDS! tickets into the Vermont Lottery’s 2nd Chance Top Prize and Quarterly drawings. Click here to enter tickets or to become a member of our 2nd Chance Club. Stay up to date by visiting the 2nd Chance site often, checking on draw dates, times, and scanning the winner’s page to see if you’ve won a prize.